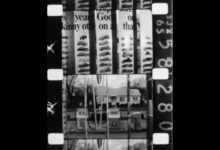 A view of a gas station is seen from inside, behind a multi-paneled tire ad display. In a 2 1/2 minute sequence, a simple series of ordinary events is viewed intermittently through the opening display. This sequence is then divided and rearranged 7 times in reverse order. Each time the divisions are greater in number (smaller in size) until finally the film appears to move smoothly backwards, divided by a single frame. In information theory, a 'moment' is defined as the shortest duration at which no distinction can be made between units of information. This work is a demonstration and exploration of the line between human information and machine information. It dynamically reveals film's basic unit, the frame.